Rainbow Grocery cooperative has a long and rich history. We’ve lived in three locations, survived the demise of the People’s Food System and still have workers who joined us when we were a volunteer organization. Through it all, we’ve developed into a strong and diverse business while remaining true to our vision of creating and sustaining a democratically-run, non-hierarchical workplace. Although it quickly became a secular project, Rainbow Grocery was started by a spiritual community, an ashram that existed in San Francisco in the early 1970s. In order to have access to inexpensive, vegetarian foods, the ashram had a bulk food-buying program. The buying program was coordinated by Rich Israel, an ashram member who also worked for the People’s Common Operating Warehouse of San Francisco, a political project using food distribution as a form of community organizing and political education. The People’s Warehouse was striving to build a “People’s Food System,” including a network of small community food stores throughout San Francisco. Rich helped convince the ashram to launch a community food store. When Rainbow opened in the summer of 1975, the People’s Food System already had two stores: Seeds of Life, in the lower Mission, and Noe Valley Community Store. 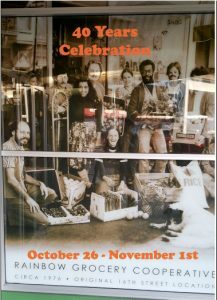 The ashram members who organized the opening of Rainbow Grocery ­ (Rich Israel, Janet Crolius, Bill Crolius, and John David Williams)­ did so largely by studying and copying the operations of the Noe Valley store. Around that time, many other community food stores opened, including: Community Corners (Bernal Heights), Noe Valley Community Store, Haight Community Store, Inner Sunset Community Store, Other Avenues Cooperative (Outer Sunset), The Good Life Grocery (Potrero Hill), Flatland Community Store (Berkeley), Ma Revolution (Berkeley), The New Oakland Community Store (Oakland) and Rainbow Grocery (The Mission). The first Rainbow store was located on 16th Street near Valencia (where Gestalt Haus now resides). Despite the rundown nature of the street, Rainbow’s location turned out to be auspicious as it was close to many neighborhoods populated by counterculture youth. Rainbow quickly became the busiest of the dozen or so community food stores launched in the mid-70s. Rainbow opened with exclusively volunteer labor. After the first few months, there was enough income to pay the project’s two most active workers (its de facto coordinators) something approximating minimum wage. As the store became increasingly successful, it was able to bring more workers on paid staff, although people were generally not brought on to payroll until after several months of consistent volunteering. As the staff at Rainbow grew larger, the need for more defined organizational relationships increased. For the purpose of simplicity, Rainbow was started under the legal ownership of founders Janet and Bill Crolius. Though the store operated collectively, this meant that Bill and Janet were responsible for reporting Rainbow’s operations on their tax forms and were responsible for any debts or lawsuits; in 1976 they transferred ownership to a nonprofit corporation. When incorporating, Rainbow workers simply adapted the corporate documents of the People’s Warehouse, which included the Warehouse’s statement of six political principles underlying the Food System. Including the six principles was done, in part, as an attempt to appease Warehouse’s activists who thought Rainbow was not political enough. Copying from the Warehouse’s incorporation documents also simplified the legal work. Unfortunately, the Warehouse’s legal model was not very appropriate or functional. The Warehouse had written up their incorporation documents with the hopes of obtaining tax-exempt charitable status, which they were unable to do. While Rainbow’s workers already knew Rainbow Grocery would not qualify as a tax-exempt charity, they still incorporated using the nonprofit model of the Warehouse. As it happened, Rainbow started generating financial surpluses soon after incorporating as a nonprofit. In order to avoid generating a taxable profit, Rainbow distributed its financial surplus through (a) increasing the compensation of its workers (through bonuses) and (b) reinvesting money in Rainbow to fuel expansion. Rainbow’s first substantial expansion, in 1978, was the opening of a general store (selling vitamins, dry goods, housewares, books, clothing etc.) a few doors down from the grocery store. It was contemplated that selling such items as vitamins and supplements would considerably boost Rainbow’s financial surplus since these items have a higher mark-up than food items. Contrary to expectations, the general store initially ran at a considerable loss and became a significant financial drain on the grocery store. This situation eventually reversed as improvements in pricing and inventory were made and the general store became a strong support to the finanical health of Rainbow as originally anticipated. Meanwhile, the People’s Food System was becoming increasingly politicized and polarized. The various food collectives had been meeting in the system’s Common Operating Warehouse. The group of representatives meeting was called the “representative body” or RB. The members of the RB were torn between paying attention to food politics and collective food stores as a revolutionary act versus using the energy of the Food System to participate in the broader counterculture movement of the time. In addition, the adoption of a representative democracy was somewhat at odds with the collective/consensus process of many of the stores. Finally, the RB elected a Steering Committee to organize and facilitate its regular meetings. This committee in turn drafted a “Principles of Unity” statement to which member stores had to ascribe in order that they might retain their membership in the Food System. At this point, the members of the Rainbow Collective opted to go it on their own, preferring to focus on the issue of food and food access as right livelihood. It turns out that this decision was a smart one. The Warehouse increasingly became embroiled in political infighting which took on a violent character when, as part of its political program, the Warehouse began actively recruiting recently-released prisoners for its workers. Unfortunately it recruited members of rival gangs, which engaged in a gunfight at the warehouse. The final blow to the Warehouse came in 1981 when a flood destroyed much of its stock. There is some speculation that the demise of the food system could have been facilitated by infiltration and undermining on the part of members of government agents involved with Cointelpro. This however, has not been proven. The move to Mission St. In the meantime, the Rainbow Grocery and, particularly, General Store divisions had continued to grow. Indeed they had outgrown the confines of their 2,000 square foot storefront on 16th Street. In 1983, Rainbow moved to a 9,000 square foot space on 15th and Mission (now occupied by Walden House). Business jumped 68% in the first year at the new location. With this growth, workers were able to give themselves their first substantial raise and obtain group health insurance. Another advantage of the move was that it allowed the Grocery and General Store divisions to share the same building, which promoted cohesion. Despite being under the same roof for the first time, each division retained it own cash register system, policies and organizational structure. There were even rules restricting workers from being in both collectives at the same time. People got around those rules, of course, but there was little inter-divisional (and even less interdepartmental) working in this period. Another significant organizational development made in preparation for the move was creation of a Board of Directors elected from within the membership, who met regularly beginning in 1982. Prior to 1982, all decisions were made in “Joint Meetings” of all workers from the Grocery and General Store divisions. For several years Rainbow enjoyed the position of being one of the largest health food stores in the Bay Area, selling more bulk foods and having a wider variety of herbs and supplements than any other store. In addition, the dedication and commitment of Rainbow workers was instrumental in establishing some of the earliest standards for Organic Certification. It was not long before the Mission Street store outgrew itself. Even by 1988, customers and workers were literally climbing over each other to get to products in the store. It was also at this time that health food began to become more mainstream and spacious, well-lit markets began to influence what the shopping public expected when they walked into a health food store. No longer was the do-it-yourself “hippie collective” the standard model. As Rainbow approached the end of its 10-year lease, it was more and more apparent that the space at Mission and 15th was not adequate. In 1992 the store decided to begin looking for a new space. It was four years in the making: locating a space, negotiating a lease, coming up with a design, and finishing construction. One major factor that helped Rainbow in its move to Folsom Street was the ability to get a bank loan ($1 million from First National Bank) with backing from the city of San Francisco. The city guaranteed the bank loan in part because Rainbow would be creating jobs and also because Rainbow was moving into a then economically-depressed neighborhood, an Enterprise Zone designated for economic development funding. The city also lent Rainbow $400,000 in addition to backing the bank loan. In order to carry off the planning and growth involved in this move, Rainbow undertook further organizational refinement. As part of the move, the Grocery and General Store divisions were dissolved and Rainbow divided into Departments as its basic units; Joint Meetings between the divisions were replaced by Membership Meetings for all worker/owners. The Membership Meeting created an elected Storewide Steering Committee to help coordinate the Departments and overall day-to-day operations hoping to free the Board of Directors to focus on the larger financial/legal issues and long-term planning. All the planning and hard work came to fruition with our opening at Folsom Street on April 25, 1996. As with the previous move, sales skyrocketed (this time 55% in one year). The financial success allowed an increase in wages and benefits as well as “patronage” distributions in keeping with our new cooperative legal structure. The work force, hovering around 80-100 workers in the final years at Mission Street, doubled in the years following the move. The rapid addition of new members to our community made it all the more important that we preserve and pass on our history – so that we appreciate what came before us and so that we can move forward from a common understanding. The makeup of stores with similar origins in the Bay Area has changed quite significantly. Simultaneously, the natural foods business has become a competitive industry, one that strongly mimics and overlaps with the industrial agribusiness complex against which many of the first community food stores rebelled. Of the other stores from the People’s Food System only Other Avenues remains. Noe Valley Community Store and the Inner Sunset Community Store are the most recent to have closed. The Good Life Grocery survives as a privately owned business, as does People’s Refrigeration and Veritable Vegetable (a distribution warehouse). In April of 1997, Uprisings Bakery closed its doors, sadly signaling an end to an era of locally and independently produced food. Rainbow’s place in this new era is at times uncomfortable and challenging. We strive to compete with giant chains who falsely mimic our collective structure with “teams and team leaders,” although they still maintain oppressive hierarchical structures in the workplace. We are constantly forced to examine the products we buy as smaller local businesses are swallowed up by multinational corporations who may not have the same values as the original owners. With health food becoming part of our national awareness, the lines between “healthy” and “unhealthy” are not so clearly drawn. Herbal remedies are now being mass-produced and sold in pharmacy chains like Walgreens and Rite-Aid, instead of wildcrafted in local regions. “Natural foods” can now even be found at many local corner stores that typically used to only sell chips, beer and beef jerky. (And the opposite is also true, for unlike in the old days, you can find chips, beer and (vegi) jerky on our shelves.) With the advent of Genetically Modified foods and the lack of government requirements when it comes to testing and labeling, we face even more challenges. And the organic standards that we all fought so hard to create are regularly under pressure from government and industry to include practices that we abhor. Despite these challenges there are enough people who are interested in organically grown and locally produced foods to keep our doors open. We continue to stay true to our mission and hope to inspire others in the realms of healthy food, cooperative organization and sustainable living.